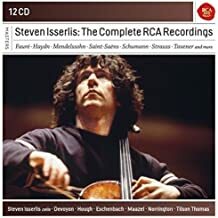 RCA 31257, 10 CDs, 14'17" "The Complete RCA Recordings"
Those who have followed the cello art of British-born  Steven Isserlis will be pleased to note that RCA has issued a "white box" (i.e., no booklet or notes) of all ten of his RCA Victor recordings. The individual wallet-sleeves contain all the pertinent information regarding venues and dates of recordings. 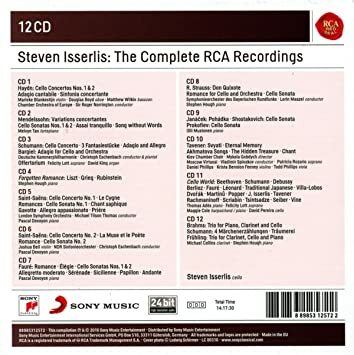 The recordings were made between 1992 and 2000 in England at which point, apparently the RCA contract came to an end for Isserlis. Isserlis has made a number of recordings - and continues to record - for Hyperion in England. Isserlis's collaborators in the RCA set include Sir Roger Norrington, Melvyn Tan, Felicity Lott, Christoph Eschenbach, Stephen Hough, Michael Tilson Thomas, Pascal Devoyon, Lorin Maazel, Olli Mustonen, Vladimir Spivakov, Thomas Ades, Maggie Cole, Michael Collins, and many others. The repertoire is very broad, including a disc of Fauré works, Haydn, Mendelssohn, Saint-Saens, Richard Strauss, Brahms, and encores, quite a collection. Interesting, too, that Isserlis's cellist mentor, with whom he befriended, was Russian Daniil Shafran. In comparison to the individual RCA CDs when first issued, the ten-CD boxed set is a tiny fraction of those original prices. I consider this a bargain-and-a-half. Well worth considering adding to your collection. Thanks, Lance! Isserlis is surely one of the finest exponents of his instrument. This set is now on my want-list! Isserlis is one of the outstanding cellists before the public today. His playing is engaging and sounds effortless. 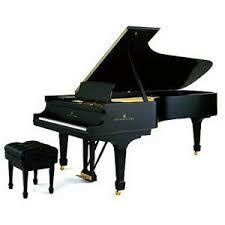 He plays a Stradivarius that is an exceptional instrument, even for Stradivarius. This is an outstanding collection. This set isn't quite complete as it omits his recording of the Barber Cello Concerto (which was part of a disc which included the Violin Concerto and the Piano Concerto).